Gazillion Entertainment has been bugging me to try out their upcoming free-to-play Marvel Heroes MMO for months now. If they had just come out and told me it was Marvel Diablo, I would have gotten around to it much sooner. I, along with thousands of Marvel fans, got my first taste of Marvel Heroes today at the San Diego Comic-Con. It was a metting I had long dreaded, terrified that my beloved Marvel characters would be mauled beyond recognition or crippled by a low budget production. Within minutes of taking up mouse and keyboard at the single four-sided Marvel Heroes kiosk, my fears were completely assuaged. This is Marvel Diablo. It's an isometric click-fest featuring Marvel's greatest. Select a character, take on a quest, and take out the bad guys, collecting rare loot and costumes as you work your way through stories written by the likes of Brian Michael Bendis. Defeat bosses for a chance at epic gear. Hold down shift and your ranged character stands still. Even the Gazillion folks call it "Marvel Diablo" around the office. The demo began with me selecting one of four characters — Iron Man, The Hulk, Scarlet Witch or Wolverine — a small selection of the ever-expanding game roster. I chose Iron Man initially, because he is my hero. The story begins in the X-Men mansion, where I was tasked with finding Professor X, a ask facilitated by a blinking yellow dot on the game's mini-map. Xavier's mission for me, illustrated with comic panels and fully voiced, was to travel to New York City's Mutant Town and do battle with the anti-mutant Redeemers, led by William Stryker. A short trip through a portal later, and I was playing Marvel Diablo. I wandered the isometric map, using a combination of mouse buttons and keyboard keys to fire off my skills. Missiles fired, grenades exploded. At one point I killed a rare enemy and a rare blue item dropped. It was a power enhancement, granting Iron Man power to fuel his attacks with every hit. Further in the map I encountered a towering Sentinel robot, which didn't seem to care that I'm not a mutant. It was a tough fight — it's a public battle, meant for multiple characters to join in — but I managed to take it down, earning a super-rare purple drop — Iron Man's blue stealth armor. I equip the costume and move on. My Gazillion handler showed me that I can swap out characters at any time. I switched to Wolverine, a rage-powered hero, slicing and dicing my way through hordes of militant mutant-haters towards my ultimate confrontation with Stryker. But there was a twist! Magneto has already made it to Stryker, and I must battle him instead! Realizing Wolverine isn't the best choice to battle Mags, I switched to the Hulk, another rage-powered hero, and finished the fight. Were this a real server I could join up with other players to help even the odds, but the only other guy I encountered was an Iron Man who wouldn't stop long enough for me to group up. Jerk. Okay, you've got me, Gazillion. You would have had me sooner if you had just told me straight. 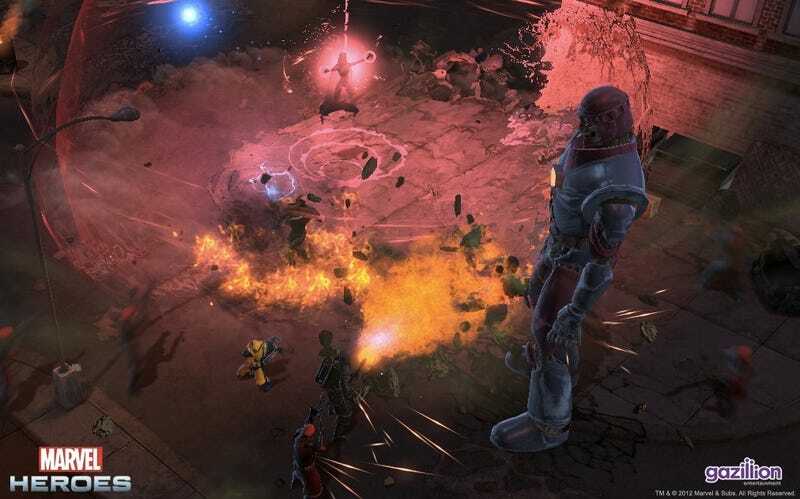 This is Marvel Diablo, and it's going to be brilliant.